Farm Fresh Feasts: Help! I just got my CSA farm share. Now what do I do with it? Help! I just got my CSA farm share. Now what do I do with it? Practical advice for folks eating from a farm share including the three questions of Vegetable Triage and what to do when you bring your farm share into your kitchen. A typical early Spring farm share--plenty of greens, peas, radishes, onions and garlic. Take a deep breath. I'm here to help. It seemed like such a great idea, back in the cold dark days of winter, to sign up for a Community Supported Agriculture (CSA) farm share. A weekly box of fresh local vegetables and fruits? I'm in! Now reality is setting in. You've got a fridge filled with unfamiliar produce and the clock is ticking down to the next farm share day. 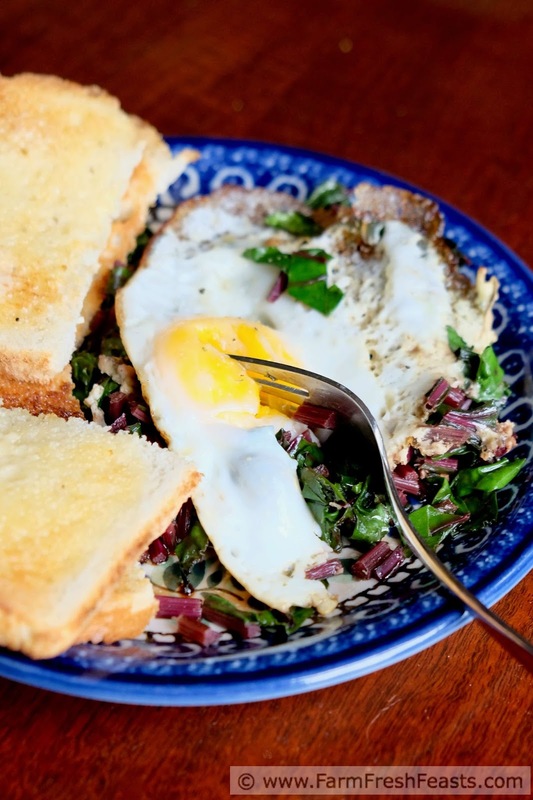 Before you're tempted to chuck it in the trash (gulp!) or swirl it down the disposal (noooo!) or toss it on the top of the compost heap (BTDT!) please read on. Every day, some Thing in life can be overwhelming, but you get thru it by breaking The Thing down into smaller chunks. This applies to grief, term papers, and parenting as well. 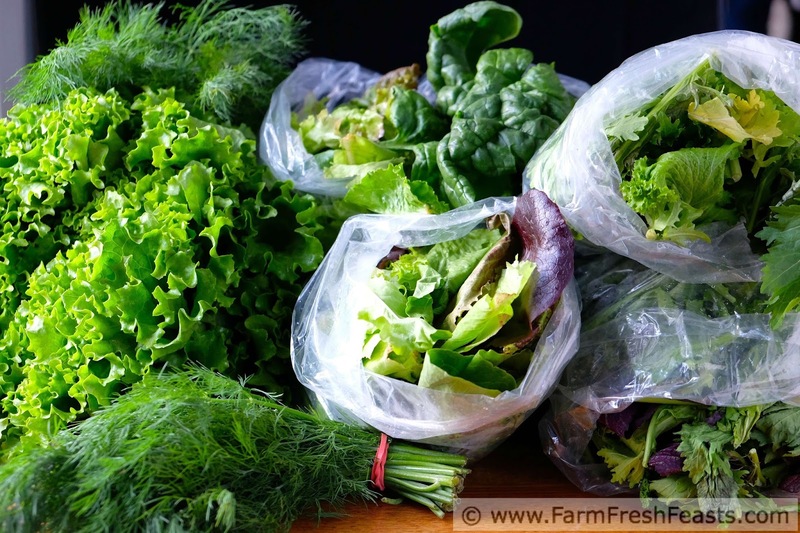 In terms of your farm share, this means you need physical, or at least mental, Vegetable Triage when the produce first arrives at your house. What can live outside my refrigerator? What can I prep so I'm more likely to use it? What do I need to use up first? 1. What can live outside your refrigerator? Onions, tomatoes, winter squash, sweet potatoes, garlic, white potatoes are all stored at room temperature. Think about where things are displayed at the grocery store and do the same thing (without the signage) in your own home. 2. What can you prep so you're more likely to use it? Carrots & radishes can be peeled, sliced, and stored in water in the fridge for snacking. 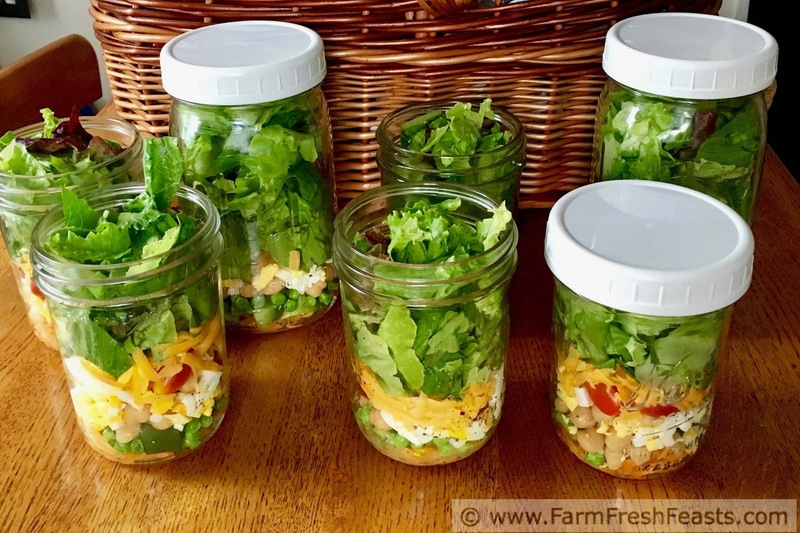 Lettuces can be rinsed, spun dry, chopped and assembled into jar salads (the best way I've found to make sure I actually eat ALL THE GREENS in the springtime). Root vegetables with greens (like beets, carrots, radishes, or turnips) should be separated and stored, roots apart from greens. The greens are wonderful, (especially my Sautéed Beet Greens recipe) and the roots will last longer than their tops. If you've got an hour to spare and don't mind turning on the oven, roast a tray of cubed vegetables for later use. If it's too hot to think of roasting, fire up the grill and slice up peppers, eggplant, summer squash, green beans, asparagus or zucchini to add to meals throughout the week. Here's a tutorial on throwing the farm share on the grill. 3. What do I need to use first? The final step in my Vegetable Triage is to determine which items are likely to spoil first, and make a plan to use them. I know that greens have a shorter lifespan than root vegetables. I know that items that need to be stored in the refrigerator tend to have a shorter lifespan than those that are stored outside of the fridge (tomatoes are a glaring exception to this--a carrot in the fridge will last longer than a tomato on the counter). Creating a meal plan to use up greens first helps me to clear them out and think about what I'll make with the rest of the produce. For ideas to help you use your farm share produce, please see my Visual Recipe Index by Ingredient. I've broken it down into categories from Acorn Squash on down to Zucchini, alphabetized and with pictures because that's just how my mind keeps happy. Small actions like chopping scallions can help you feel like you've got a plan to use the farm share, and that's the first step to combating the overwhelm that is sometimes associated with being a partner in supporting and promoting sustainable agriculture in your community. Let's not lose sight of why we do this--yes, the tomatoes taste better than the store bought kind--but more than that, we want to support our local economy, right? 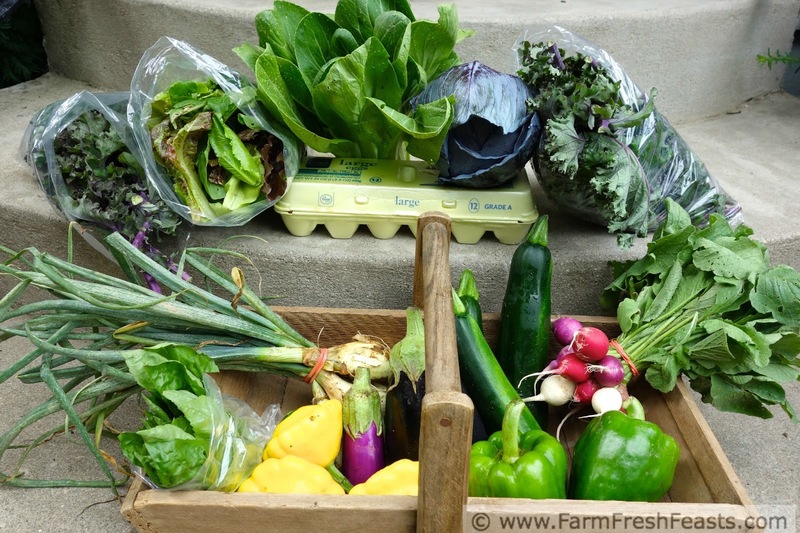 A typical late Spring or early summer farm share with greens, onions, squash, peppers and radishes. 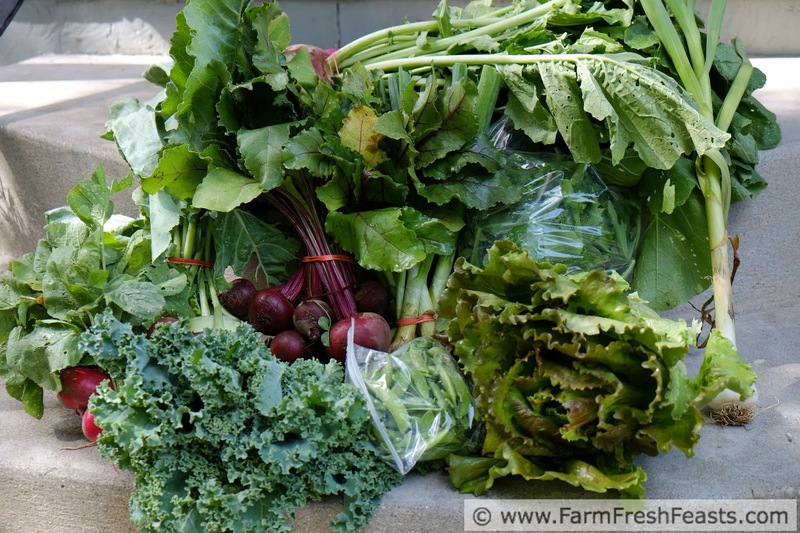 Does a CSA Save You Money? Is a CSA a Good Value? Other good resources on this site are the Visual Recipe Index by Ingredient, a resource for folks like me eating from the farm share, the farmer's market, the garden, the neighbor's garden, and great deals on ugly produce at the grocery store. Our first share is coming on Thursday (actually we'll pick it up but you know what I mean), and I'm beyond excited. I went back to the medium size this year and I put spinach and kale in the garden too (uh, what was I thinking?). Here's to the greens; they are a' coming.